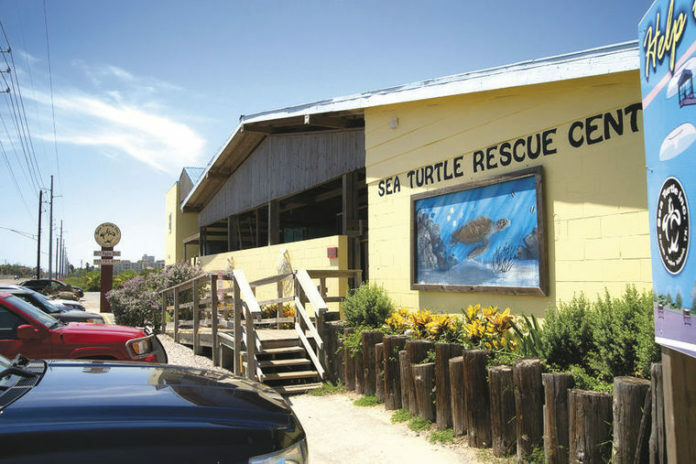 An undated image of the Sea Turtle Rescue Center on South Padre Island. After bracing for a major cold-stunned turtle event, staff and volunteers at Sea Turtle Inc. on South Padre Island were pleased yet puzzled when just three sea turtles were brought in Wednesday. Two of the turtles were alive, and one was deceased, said Jeff George, executive director of Sea Turtle Inc.
“One of two things is happening,” George said Tuesday. “Either the previous cold front has helped acclimate them to cold water, or they got deep enough that they may be able to ride through this. “Or we will start seeing them (Wednesday),” he added. Just two weeks ago, 309 cold-stunned sea turtles were rescued by Sea Turtle Inc. and teams from Laguna Atascosa National Wildlife Refuge, Texas Parks and Wildlife Department, Texas Game Wardens and other volunteers along South Padre Island and Boca Chica Beach. When air temperatures drop suddenly in South Texas, the temperatures of the shallow waters of the Laguna Madre plunge with them. When water temperatures drop below 50 degrees, sea turtles enter a state in which they appear comatose, because reptiles cannot control their own body temperatures. Most of these cold-stunned turtles are juvenile green sea turtles and are found in the Laguna Madre, where they have gone to feed. In those protected waters, the turtles become stranded and can’t make it back to warmer gulf waters. If you encounter any cold-stunned sea turtles on South Padre Island or Boca Chica Beach, call Sea Turtle Inc. at 956-761-4511.